Flesh coloured fabric on arms and cut-out in legs. With Catman's iconic print on the mask and the Costume on point, this truly is an amazing Costume for any Kiss fan. 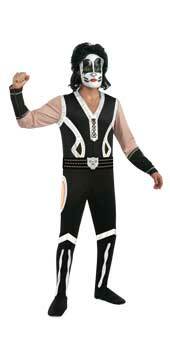 With the whole Costume included all you need are some wild moves and some KISS music to rock to. All black with white ascents and cut-outs with material inspired by Catman's remarkable Costume worn on performances.